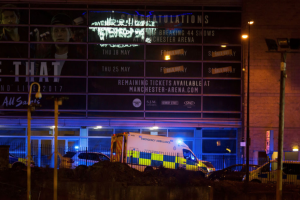 The group claimed one of its members planted bombs in the middle of crowds at the 21,000 capacity Manchester Arena, but British police have so far only mentioned the use of “an improvised device” in the attack. The U.S. has not yet verified that ISIS was responsible for the attack, Director of National Intelligence Dan Coats said. ISIS says “a soldier of the caliphate planted bombs in the middle of Crusaders gatherings” then detonated them. It did not say whether the attacker was killed. Queen Elizabeth II also offered her sympathy for the victims. “I want to thank all the members of the emergency services, who have responded with such professionalism and care. And I would like to express my admiration for the way the people of Manchester have responded, with humanity and compassion, to this act of barbarity,” she said in a statement.